But... be careful. That piece could easily have planted there before it was picked up. It seems to be a stabilizing fin stuck into the ground. And that happens to be the same kind of shell. So it seems likely that these were HE tank shells. It means they have a good view on thoose buildings in Avdiivka and can see the impacts (or zero them in). Russia intensified it's attacks including deliberate targeting of civilian areas (either occupied or not). It is a coordinated attack including Social Media attacks by the St. Petersburg Troll centre. Of course, as always Russia blames Ukraine. 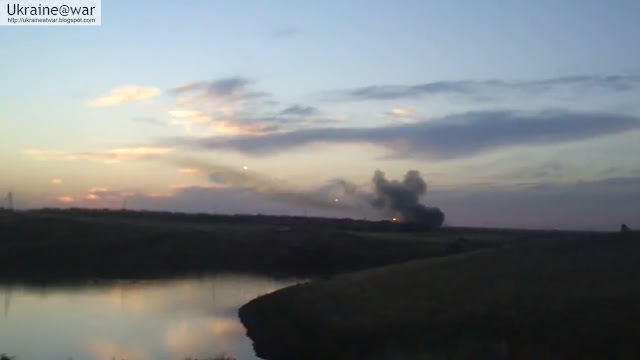 But it may be clear this is Russian instigated shelling. And we all fear it is the prelude to a new massive summer-offensive. In this blog I synchronised and analysed the several footage of the Right Sector incident in front of Antares Health Club. The quick impression that the police-footage gives, is that RS must have shot a man, they take the body and drive off when a firefight happens north of the city. why did the police mute all the audio? why did the police not include the earlier shots captured on security camera? why did a man INSIDE Antares ask some soldiers in to get the body? why did they bring the body back again? why does the police video not show they brought it back again? CLEARLY, the police video was edited to show only parts of the events and as such, to give a WRONG impression! Furthermore, the fact that a lot of local thugs happened to be around with machine-guns cooperating with the police does not help to convince their view. As everywhere in Ukraine, old-style-Yanukovich-police is as corrupt as can be. In a border-town as Mukacheve this won't be different. It is one thing to quickly block the road with some cars on the route that you think RS will take. But it is another thing to build something like a pillbox. That needs time and thus (a lot of) planning ahead. So now here I will present here a scenario that DOES answer most of the questions. And that scenario is this: Right Sector was setup in advance to walk into a trap. RS was invited to the Health Club to talk with local businessman and MP Mykhailo Lanyo. It means they knew long before that they were coming and of course... they would not come unarmed to a place like that. The roadblock with the sandbags is NOT on this route. 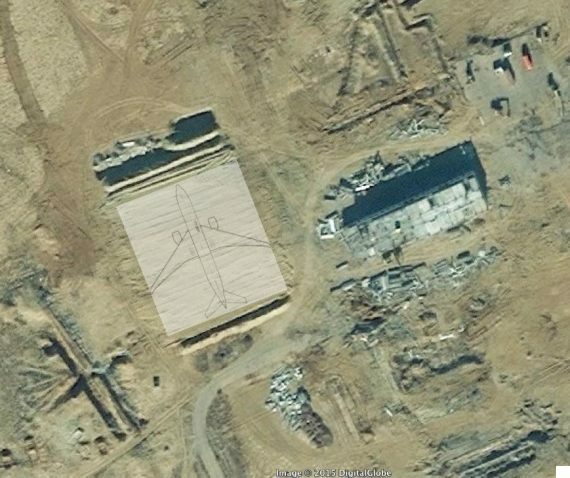 It means this could have been build already without RS noticing it on the way to Antares. Next thing is that the police is filming the RS area from two sides from a safe distance. Since the cameraman is on the left side of the road and the cars pass him at the right side, he must be at the position of the icon, which is some 125 meters away from the RS positions. The black stroke on the upper side means he is not filming from the open, but likely films from inside a car. And thus likely the car that followed RS to the roadblock/ambush position too. The white car on the right side can be easily positioned on the map. At quite some distance there is another white car at the left side and yet another in front of that one. What we have here is two strategically positioned and hidden cameramen that can film RS from both sides. And they film the area even BEFORE the police officially arrives (after 50 minutes). It means this was setup and they meant to film everything. Who shot the guard and from where? On the security footage it can not be seen that anybody from RS entered the gates, yet the security guard that got heavily wounded was shot BEHIND the gates! This is the last time we see him before he got shot. It means a shot must have been fired at that time and something was going on on the left side. Unfortunately we don't have footage from that moment. But for sure we can tell the shot did not come from RS soldiers from the right side, because we can see them on the security video and nothing happens st that time on that side. So the shot likely came somewhere from the left side. But how could the guard have been shot behind the wall by RS? But this is at the moment his mates pick up the body from there. And the people who are looking at the left when the shot was fired could not see him, so they did not look at this position. It means he was in full sight, everybody was looking at him and he decided to shoot/kill the guard through the fence. Another option is that the thing that was going on in the blue area was just meant as a distraction for all. And meanwhile, while most people were looking somewhere else, the guard was killed from WITHIN the Antares perimeter. In that case everybody would be looking at the soldier and the would THINK he shot the shot. 1. In between the trees. Perfect spot. Nobody can see you. But difficult to tell if you can really shoot through the fence from there. 2. From behind the building. Exposed position. Anybody, including the RS soldiers could see him. On the other hand it is a quite safe position because one can immediately retreat behind the building again and we know that other armed men arrived moments later. On the other hand a sniper would be tremendously exposed and could be easily spotted from other locations in the neighbourhood. 4. From behind the wall. It's pretty safe, there is a small risk of getting spotted by RS and it would be easy to hide or retreat. But it is not certain if a shot could be taken through the fence from here. Maybe the building blocks the view, maybe there is a small view. It seems to me that the first position in between the trees (IF it would be possible to shoot through the fence from there) would be perfect. Safe distance, can't be spotted, easy to hide and retreat. Why did RS take the body? Moments later they drag the body into the car, so this man must have asked them to take the body!!! I repeat: the man in white cloths must have ASKED RS to take the body. The BIG question is: why did they give in to this request? Did the man ask/press them to take him to the hospital? But why not let one of their own drive him to the hospital? Moments later they bring him back again when an ambulances arrive. The big problem is, that the hidden cameramen filmed all and it looks really bad on video. But the police video has been edited to emphasize this aspect by freezing the frames and going to black and back again several times. Simultaneously the ambulance that arrived at the other side (and potentially blocking the way there) turns and drives away again (without taking any wounded). There can only be one explanation for this. They WANTED RS to drive forward and not turn around and go back. A ten minutes drive towards that roadblock is enough to put some cars across the road. But it is NOT enough to build fortifications with sandbags as were present there. This means RS must have been FORCED to take this route and it was planned long before that there would be a confrontation there. There are a lot of weird things going on. Most of them can be very well explained if we consider a scenario where RS had been setup, framed and cornered/attacked at the roadblock. Would 'they' kill a guard (of their own) for this? Remember the scenario at Slavyansk where an blockpost was attacked in the middle of the night and a clean 'Yarosh-card' was found and a completely burned car. Some locals died there, but it was a setup aimed to get the Slavyansk locals at their side and ready to defend their city with force. It is what Girkin/Strelkov called 'I started the war in Donbas' and he used these dirty trick for it. Nevertheless, even though a lot of locals bought this, the world did not. In order to convince the world 'they' can not do the same trick again. It has to be something more sophisticated and not so easy to trace down. That's why this time 'they' used REAL RS soldiers instead of imaginary ones. 'They' filmed all, but only published the parts that compromise RS and put them in a bad light. At Maidan snipers killed a hundred civilians. In Odessa Russian provocateurs protected by corrupted police setup hooligans to attack the administration building, killing a lot of pro-russians. One guard in Mukacheve (innocent or not) means nothing for these people. Sure... RS has been stupid enough to take the bait. Sure... it is not good to have some sort of autonomous paramilitary groups roaming the country and shooting around with guns. They have fallen in the trap that was setup for them. RS is the core of the Ukrainian volunteers who defend the country at the frontlines. The most patriotic groups. Without them Putin would have its corridor to Crimea already. To discredit RS is EXACTLY what Putin would like to see. Furthermore: internal conflict between the government and RS benefits Putin. And: conflict at the doorstep of Europe (instead of far away Donbas) benefits Putin. It means some European politicians will hesitate to either support Ukraine or to allow them into the EU. So it benefits Putin. Of course local gangsters and corrupt police might benefit too and therefor eagerly cooperate. Just the fact that the Russian Troll Factory released so many fake story, shows who is behind it. A local RS group has gone mad, shoot a local mafia guard, drag his body on the street, on second thought throw it back in the garden and when they try to get away they shoot at everything that moves. Your choice what you think is the truth. This blog analyses some aspects in more detail. Security cameras had recorded the arrival of Right Sector at Antares Health club, Mukacheve. Also the police released footage from that scene. At 1:10 in the CCTV footage the cars start arriving. At 2:35 the men leave the cars. For a long time nothing seems to happen. Soldiers walk up and down the road, but they can never be seen entering the gate. At 44:24 a soldier walks towards the gate and talks with a man who points his arm to the left. At 44:53 a second soldier walks fast towards the gates and the two soldiers enter the gate, with the other man directing them. At this point the police footage starts. At 45:43 the two soldiers can be seen dragging a body outside the gate. At 46:33 they put it in the car. At 48:46 they get the body out of the car again! Note the Ukrainian flag in the middle. At 48:58 the soldiers can be seen dragging the body into the gate again. At 49:09 they walk back. Note the Ukrainian flag in the middle. Yet, the security footage never shows an ambulance driving through the view. At 49:37 they park a car so it blocks the road. At 50:35 he runs away from it. What was going on anyway? The soldiers did not seem to enter the Health Club. Where they just waiting for someone to come out? Why did the police not show the footage from the first shots? How did the bodyguard get hurt and who did that? He got hurt INSIDE the gates and no soldiers were seen entering the gates. Why did the police mute all the audio, except for that little moment where Right Sector fires warning shots when a car blocks the road? Why did RS take a body of the other side? Why not let them take there own dead/wounded? Clearly a man INSIDE the gates asks the soldiers to take the body. HE directs them. So they take the body. But they are quite rude with it. Maybe next thing is they saw an ambulance arriving and decided to bring him back again.